Teats to 41 for Likud. Kach Party, one seat each. Tehiya Party is Likud's ally. ever made with the U.S.
made available to the U.S.
liberty while providing no real military benefit. violation of an Air Force dress regulation. commanding officer to ban the wearing of the skull cap. with a twinkle in her eye. Israel. I love it," Ruth said. * MOSAIC Sunday, Aug. 5 and 12, 9 a.m.
? L'CHAYIM Sunday, Aug. 5 and 12, 7:30 a.m.
with host Dr. Simon Silverman. SHALOM Sunday, Aug. 5 and 12, 10 a.m.
Israel Scouts again and travel ^ ^ ^ shabbt| cjm(J|es dur|ng g FrM; "
Toronto before returning to ^^ Con)|nun|ty Cen(er watche8. frequently as they once did. with a superior environment 0"
and one by regular mail,"
the son of a refusenik. We were very glad to receive your letter. 23, DV. 43. Shifrin Vladislav Semynovitch. ago in hope that we soon shall be there. But, we didn't receive the exit visa permit. now they will live in (Zdahov) Azov Sea. We don't know what to do now. Kaunas is a beautiful town, very original. see you, whenever you come! please send us your birthdays. dictionary to write this letter. Erj.tor and Put>iiin.r Encutiv. Editor ,,. Pubi.aiwd WMkly October through M,a-*p..i B' *""' "'^V"
Combtn*) j.,.h App.al-J.-Lh FkK.tK>n ot Palm B..ch Com*,. ^ '^*'' Barb.-. My.on J Nickman Vic. Pr.SKj.nta. Pt.r dimming.. Alc Eng..st.m_ AmoW Lamp, v o.
m.tanal to Ronn, Epst..n. Director ot Publ.c Rations. SOI South Flag*' 0- "' "
SUBSCRIPTION RATES Local A,.. S4 Annual .2 Y... Mm,mum $7 Ml 0- b, -. M*-ai,onotP.imB..cn Count, MIS Ft.gi.r0' West Palm Beach F.a 3340.
would be held in abeyance. terms ot the national interest. contrasting white collar b not JJJJJ^ ,,.,. only a la mode, but it empna luu^__f ^ ohattn mht. weighs Sammy Davis. Jr. down. ler he was dead or alive. Israel and the Jibril group. Levinson, son of Miriam N.
Beach and the late Merton B.
lege of the Palm Beaches. ^pi*Stick On foryour telephone receiver. telephone numlxT stick -on ftw. Mail to (iuardian Hans, Inc.
An InNI KAM 1" jJT(fWniNi KV27 Ml W 1 HI UMBnAIWUIMI 1>IHM' landpartKipatwuHondanimtalflinw. nmU The Jewish PWUfa. .,_ . the Technion's Department for Biomedical Engineering. new insight into heart disease and its treatment. before getting on the highway. Make a short long distance call! style and save as never before! tailored wool and wool blend suits ever. 1 than just fashionit's a life-style. ^^ and it's "just the right touch,"
special, they will take your breath away! shopping at Loehmann's means value. Loehmann's is often imitated but never equaled. Palm Beach Gardens Loehmann's Fta 4100 PGA Blvd. voted on at the convention. campaign, caused by the Rev. to earn it," she said. New Crystal Light- Drink Mix. Ledge and skills as well. Lieves in an "open door"
age 14 The Jewish Floridian of Palm fWk r.
the PLO in Lebanon (1982). highest taxes in the world. army is also readily apparent. each bullet is worth 16 cents. for an hour costs $7,000. thre percent went to Israel. Publix Bakeriei open at 8:00 A.M.
etween Israel and the U.S.
Iai,0ns "II the AJC office. the Lavi is just beginning. San Francisco Hilton Hotel, Aug. 26-29.
authorities in fields related to Hadassah's activities. Association, on Military Trail and Gun Club Road. at Silver's Steak House, 1900 Palm Beach Lakes Blvd. For gift, display or wear. 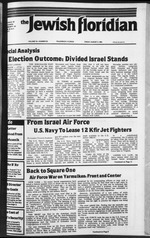 Page 14 The Jewish Floridian of Palm iwi. Menu for the week of Aug.
next meeting will be Aug. 7.
we who live in freedom." the American Savings Bank, Okeechobee Blvd. at 7 p.m.
refreshments. Bring a friend to meet new friends. S9.95 per person. Hostess for this event is Toby Chabon. move to the launch area. Jewish' Community Center's Camp Shalom recently. Released amidst a chorus of "oohs" and "aahs,"
Atrani.i, seven, came from Ft. Pierce. on the floor or on low stools. guess I just gave up." Ramat Gan, near Tel Aviv. tion," the neighbors called it. life-style of the intact family. 8:15 p.m., followed by Oneg Shabbat. Saturday: 8:30 a.m.
Cantor Earl J. Rackoff. Sabbath services. Friday 8 p.m.
(Jlade 33430. Sabbath services Friday. 8:30 p.m. Phone 996. 8:45 a.m. Rabbi Nathan Zelizer. Phone 793-9122. Dardashti. Sabbath services, Friday 6 p.m. through Aug. 31. 1869. Friday night serivces 8:15 p.m.. Saturday. 9 a.m.
Jude Church (Parrish Hall) 204 U.S. No. 1 So mau"
West Palm Beach. Mailing address. P.O. Box 1700B. Palm Beach, FL 33416. Friday services 8:15 p.m.
33407. Phone 833-8421. Rabbi Howard ** "
many guests who worship at Cantor Shore. fth end of town only. Ida. 88, of Canterbury Century Village. Jacob. 88, of 880 N.E. MUl Ave..
Rubin. 78, of 2MB N.E. Third Court. '.ol Berkshire A4. Century "'"I?*.. of We.t Palm Beach. LfiL5 Beach. Rlv-ld. SA^SmTwSSi Home. Martin, 78. of 13008 Pobiclana Blvd..
Row, of Coventry F. Century Village. 85. ol 509 Fifth Terrace. .A Estates, West Palm Beach. hi* Chapel. West Palm Beach. ray. 78. of 13735-1) Flora Place. 1 D.. 71. of 2863 Crosley Drive W.
* of 88 Sparrow Drive.
. of 2i6 8. Garden Drtva. Fabius is and remains a Jew. entitled "Partnership for Life," now adorn the entry wall. 9 mg. "W. 07 mg. mcotmt ft pm ugmtn. FTC Report FEB. 14.